SYNOPSIS - Abroad the Vociferous Carcmichael puppeteer John Chandagnac is sailing toward Jamaica to clain his stolen birthright from an unscrupulous uncle when the vessel is captured.....by pirates! Offered a chance by Captain Phil Davies to join the seafaring band or die, Chandagnac assumes the name John Shandy and a new life as a brigand. But more than swashbuckling sea battles and fabulous plunder await the novice buccaneer and on the roiling Caribbean waters - for treachery and powerful vodum sorcery are coins in this dark new world. As for the love of beautiful, magically imperiled Beth Hurwood, Shandy will set sail on even stranger tides, following a savage, ghost-infested pirate king Blackbeard and a motley crew of the living and the dead to the cursed nightmare banks of the fabled Fountain of Youth. EXCERPT - The crack of a pistol shot cut through the rising babble, and Chandagnac saw the man who'd advocated abandoning ship rebound from the capstan barrel and sprawl to the deck, his head smashed gorily by a pistol ball. Looking away from the corpse, Chandagnac saw that it was usually good-natured Chaworth who held the smoking pistol. "You'll go to the boats when i order it!" Chaworth shouted. "No gun blew up, nor's there a fire! Just smoke -"
As if to verify the statement, a dozen violently coughing men came stumbling up the companionway through the smoke, their clothes and faces blackened with something like soot. FL Speak - I hope you folks made the connection already. Yes, this is THE BOOK that inspired the fourth installment of the Pirates of the Caribbean franchise. Although the plot looks the same, let me tell you this book is vastly different from the movie. Then story begins with John Chandagnac upon a ship where he meets Beth Hurwood. Thanks to her father abroad the ship, the ship is soon captured by pirates. After injuring the pirate captain, he is given a choice to either join them or die at the spot. Thus, John's life as a pirate begins. Even though the name Jack is similar to Jack Sparrow we have all come to love and remember, John Chandagnac or John Shandy is a completely different character yet a pleasant one. Even as he plans an escape from them, his life as a pirate is sealed when he rescues the pirate captain from the clutches of the Royal Navy fleet and effectively destroys the ship when he had a chance to live as a free man. 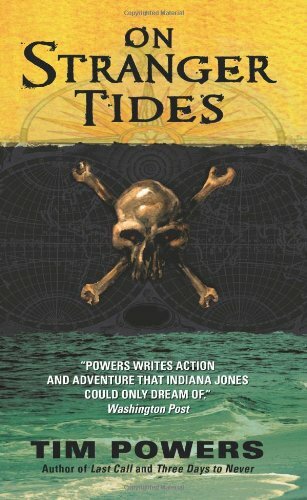 As his friendship with the captain and Beth grows, he begins to grasp the bare beginnings of knowledge of magic in the old world the pirates practise in the Caribbeans. The book jumps from one adventure to another when Blackbeard joins them and takes them to the fabled Fountain of Youth. 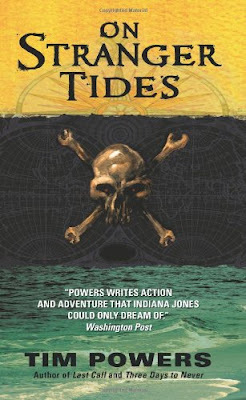 Only then he realise that Beth Hurwood's father, who masterminded the capture of his previous ship has a far sinister plan that involves voodoo and his daughter and Jack vows to protect her at all costs. As the confrontations begin, Mr. Hurwood's apprentice becomes more powerful in magic and kidnaps Beth and leaves behind them an angry and a clueless crew. As Jack and his captain rush to get Beth back, they encounter ghost ships and their crew who were lifted up from the dead by sorcery. Towards the end, it is realised that Blackbeard is far more cunning and diabolical than he was portrayed and his quest for immortal life can only be checked if John had paid heed to the knowledge he had gathered across his journeys. This is one fast-paced exciting book. Pirates always manages to send my blood racing through my veins. A powerful book with a powerful plot and you would want to finish the book in one-go! My Rating - 3/5. A recommended book.